Sales! Sales! Sales! - Cars! Cars! Cars! Autoblog reports: By The Numbers: May 2007. What kind of effed up month was May that GM sales are up and Honda's are down? In any event, way to go, Saturn! And good riddance, Jaguar! Another example that building cars people want is a good bidness. Does anyone ever say, "Man, I gotta get me a Jaguar?" Now, we're not claiming that people get all wet and juicy for a Saturn... or do they? 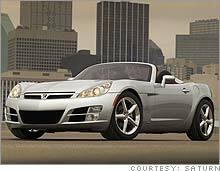 The new Saturn Sky is obviously a knockout that gets your juices flowing, but when a mid size sedan has a similar cause and effect, you know deep in your heart it ain't a Saturn. WRONG, IT IS A SATURN AURA XR sports sedan. I couldn't believe my eyes. It is beautifuly finished inside and out, it looks more expensive than it is. Then I drove it. WOW! iT REALLY MOVES OUT AND IT RIDES AND HANDLES LIKE CERTAIUN GERMAN SPORTS SEDANS I COULD NAME. And it's really quiet. You've got to try it to believe it.